This is a private tour for 1-3 people. We can do as much as you like and can fit in 8 hours. 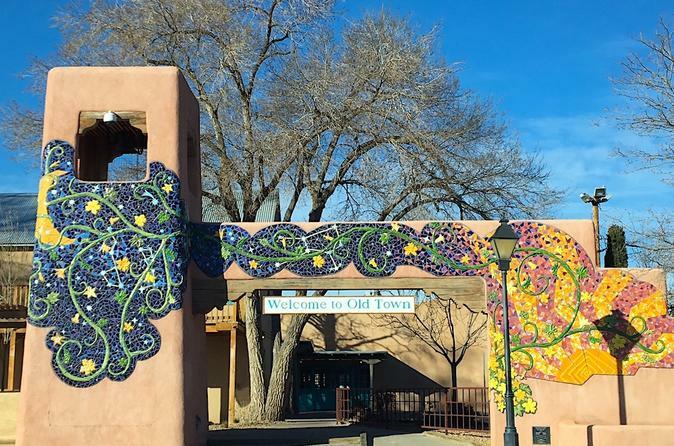 We can drive through historic Route 66-downtown Albuquerque; visit the Indian Pueblo Cultural Center, museum, & store; Old Town-plaza, church, hidden patios, galleries/shops. This is a perfect tour of the present and past filling you with beauty and delicious food. Lunch options are many depending on your cravings. Great Photo tour! A drive to the Sandia Tram is another possibility. This trip on the Sandia Peak Aerial Tramway transports you above deep canyons and breathtaking terrain a distance of 2.7 miles. At sunset the desert skies produce a spectacular array of color, and your vantage point from the observation deck atop 10,378 foot Sandia Peak in the Cibola National Forest affords an 11,000 square-mile panoramic view of the Rio Grande Valley and the Land of Enchantment. We can take 1-3 people on this tour. for more please call.